We keep hearing about an impending El Nino winter and it is hard to imagine so much rain coming after the heat we experienced in August. However, we also had some rainfall and cloudy, humid days, so it appears that El Nino has already begun. August brought high heat temperatures followed by stormy skies and thunderstorms. The extreme weather of heat and rain is the right combination for ants to seek shelter indoors seeking a break from the elements. Ants will move inside when there is either too much water or a lack of water. When the ants move in, you might feel like moving out. Don’t move out just yet! Call AmeriGuard for a French Valley ant service. 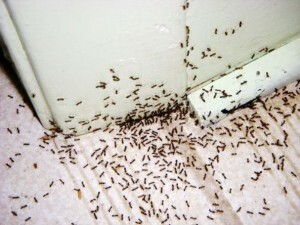 People sometimes think that they will try to address an ant infestation on their own. Over-the-counter products will help get rid of the ants that you see scouting or trailing, but it will not target any of the ants in the walls or get to the root of the problem, which is the ant nesting location outside. The ant sprays that you can purchase at your local hardware store are most likely highly repellent and will push the ants away until the product wears off. 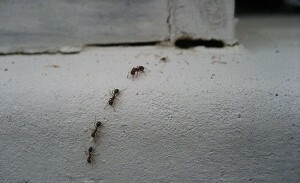 At this point, you will see a resurgence in ant activity even though you thought you got rid of the problem. Most homeowners end up exasperated with the frustration of chasing ants in and around your residence because the colony at the source has not been identified or addressed. Argentine ants come inside your house in search of food. Our pest control technicians will follow ant trails back to the source of the problem and treat the colony with non-repellant, transferable insecticide product. We take steps to eliminate the colony at the source and provide a throughout exterior treatment to prevent them from entering the structure. Customers who are on year-round maintenance ant control plans are under guarantee for ants as long as regular services are kept up. Why doesn’t AmeriGuard require contracts? AmeriGuard has never required contracts in order to use our services. Why? Because we know that you might need pest control year-round. Sometimes a problem is addressed easily and you do not need to be on a routine service. Some customers don’t mind if a problem exists on the outside of their property and only need a service once the problem moves inside. We want you to have a need for our services and not be bound by a contractual obligation. We also understand that sometimes things happen and you may need to postpone or cancel your service for a period of time. That’s okay! Call us when you are ready. We find that this arrangement works great and that both parties are satisfied and not obligated to keep up a service that is not needed. AmeriGuard will never require a contract for general pest control – just call us when you need us. The benefit to continuing with a regular maintenance plan (monthly, bi-monthly or quarterly services are available) is that you will be guaranteed year-round for all general pests as long as you keep up your regular services.